Yes, there are still two days left before June but I know how this story ends. Why? Because I’m sick again. It was exactly this time last month I was complaining about barfing up my guts and here I am again, this time with congestion, runny nose, sore throat, the works. I think it’s The Bubons. So it is with unfortunate certainty that I know May’s numbers won’t change. Look at the patchwork of my Polar graph this month. It’s supposed to be all red! But it hasn’t been all bad. I have had one successful self-guided tour completed, plus one more on the road as I write this. I’ve also had 2 custom tours come in for next month in Provence, which will be fun. The sun is even out now and the temperatures are nearly not cold. I visited my doctor today (7€) and got 4 different types of medicine (7€) to dull the pain till whatever I have passes out of my body. June is right around the corner and Haute Route is right around the next one, so look for more impressive stats coming soon. If you don’t, please come to the Alps on August 18th. I’ll need someone to scrape me off the first col we go up. Here’s hoping the road ahead is as good looking as the one below. You’re not alone (if that makes you feel any better). May started well with my mini ‘training camp’ then had crappy weather here, then 1 week ago I woke with a sore throat a bit of sneezing but total lack of energy. I wish I could say it was from overtraining but my wife started showing symptoms a couple days ago. Today first day felt like I could ride, and I get hailed on and massive downpour halfway through. Actually, Luck it does make me feel better! Once summer decides to land, we’ll have all forgotten our Spring woes, I hope. That’s all I’ve been doing for the past few days. It’s not helping. Hope you feel better soon. In comparison, how often were you sick while living in Singapore? Probably not that often. Thanks. I had plenty more hangovers in Singapore. Does that count for ‘sick’? Hang in there Gerry — best to rest and get better first. We still have 12 weeks. Jan, thanks for that. I like in particular the casual way you mention ’12 weeks’ as if it’s an eternity away! 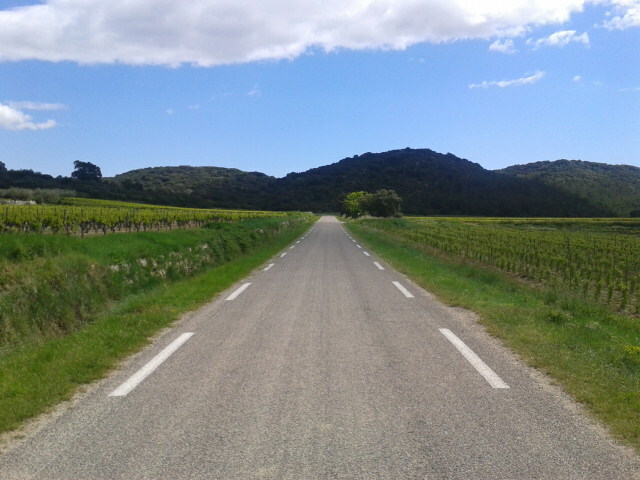 Bonne Route! Jan, I’ve been following your blog a bit and am quite impressed with the precision approach you are taking. 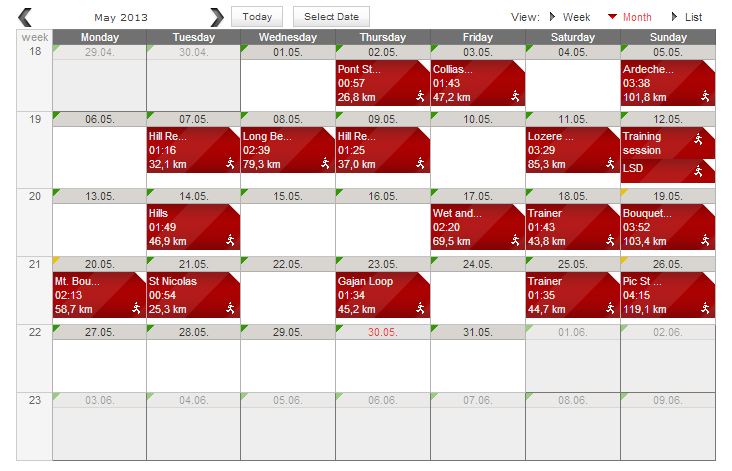 I think I can confidently say that I’ve never seen anything as detailed as you training plan! From what I could understand, it all sounds great. Hope we get the chance to meet somewhere between Geneva and Nice. Look after yourself. Get well soon. Thanks, TP. I thought I was looking after myself, which is the frustrating thing. Excellent! Not many barns down here but I’ll try. Be well, take care, chicken soup. No matter what, you will need no “scraping off” the first col. Maybe the last, not the first. Have fun with it all, you only do this, this year, once. Thanks, Suze. I think I’m feeling better now, but it could be the drugs, too. My goal is to start back tomorrow, so I begin June on the right foot. Stevo, you’ve got a good excuse for that lack of red on your imaginary Polar calendar, unlike me. It has been rude down here, you’re right. Sun’s up today, though. Thanks, and see you soon. I’m still holding your Focuc saddle ransom! My doc said the same thing. It’s ‘going around’. Good luck with increasing the mileage. I’m sure the rain will stop soon…or does it ever where you live?? Summer finally arrived yesterday. I think rain is done for a few months now.